Wireless devices like cellphones, tablets, and laptops send out signals that are all around us, but completely invisible to the naked eye. Electromagnetic radiation is everywhere that is transmitted from millions of towers and Wi-Fi routers, which create a pulsating and invisible world around us. 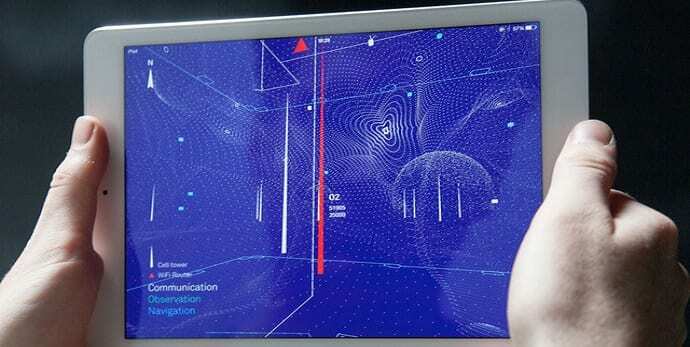 To visualize the landscape wireless world around us, a Dutch artist named Richard Vijgen, who is also a programmer from Netherlands has created a new iOS app called Architecture of Radio, which uses your GPS location to give a 360 degree visualization of the unseen digital world. Using datasets of almost 7 million cell towers, 19 million Wi-Fi routers, and hundreds of satellites, this $3 augmented reality app created by Richard Vijgen plots the ‘infosphere,’ the intricate network of signals both wired and wireless. ‘The purpose of this app is to make the invisible visible so we can look at it, think about it and discuss it,’ the iTunes description says. The app plots the densities of digital signals, like radio waves, which exist outside the spectrum of visible light on a 3-D moving graph. According to the App website, it is site-specific, and works by ‘reversing the ambient nature of the infosphere; hiding the visible while revealing the invisible technological landscape we interact with through our devices’. You can now download the $3 iOS app for iPhone or iPad from here. When you fire it up, you see a cobalt-blue screen where the app takes your GPS location and loads a series of datasets drawn from a global database that includes the cell towers around you and the satellites overhead. The Android version of the app is expected to roll out soon. plotting wired networks ? from a dataset ? .. is that the NSA dataset ? Uh, not in Apple’s iTunes? Uh, no thanks, A LOT.